500 Clown Macbeth is the signature work of the Chicago-based performance art theater group 500 Clown. Intent on breaking through what’s known in theater as the Fourth Wall (that invisible barrier between actors and audience), three actors—Molly Brennan (Kevin), Adrian Danzig (Bruce), and Paul Kalina (Shank)—deconstruct the Shakespearean tragedy of ambition. However, they are also literally and metaphorically deconstructing the traditional experience of theater. On December 2, 2006, at the Clarice Smith Performing Arts Center of the University of Maryland in College Park, the troupe under the direction of Leslie Buxbaum Danzig performed in a cabaret staging that included chairs on risers, tables in front of a non-permanent stage, a cash bar, and a complimentary hors d’oeuvre buffet. Because each show is slightly different given the actors interactions with the audience, how the theater is set up is significant. Theatergoers who arrive late become part of the actors’ drama. People who try, however discreetly, to serve themselves from the spread of gourmet goodies while the show is underway change the theatrical action. When the lights went down announcing the start of the 70-minute performance, one heard heavy breathing as the three clowns climbed over the back rail of the risers. Then the three clowns, dressed in kilts strapped across their upper torso like capes, appeared in a smoky light. The opening words of the first witch in Shakespeare’s Macbeth, “When shall we three meet again in thunder, lightning, or in rain” were divided between the three clowns who strikingly all had red ears. Then the electrical flow changed and the clowns made contact with the audience in a flap about who was king. At first Kevin and Bruce said Shank was king, but Shank grabbed the hand of a man in the audience who he thought was king. On bent knee, Shank kissed the man’s hand. Once Shank understood he was being called king, he adjusted his kilt around his waist to show he was taking charge. However, pandemonium ensued because Kevin in a compelling vocalization asserted that he wanted to be king. In various ways including the use of puppetry created by human hands, Shank tells Kevin no. (Bruce effects a bird with his hands that flies over to Kevin to deliver Shank’s message. No, the bird said.) Molly Brennan in a tour-de-force set of actions asserts Kevin as a Kabuki hero on bent turned out knees and menacingly raised arms and then in the clown persona, Brennan drops to the stage in a noisy rage fit, kicking and screaming. Of the three clowns, only Brennan is not one of the original creating players of 500 Clown Macbeth. In fact, the actor who she replaced was a male, so now Brennan has created a gender-bending dynamic on who Kevin is. The audience is not being asked to think of Kevin as a cross-dresser (Brennan is the only clown wearing a pink tutu, otherwise her clothing is similar to what the other clowns wear) but there is an odd edge thrown at the audience concerning Kevin’s identity. 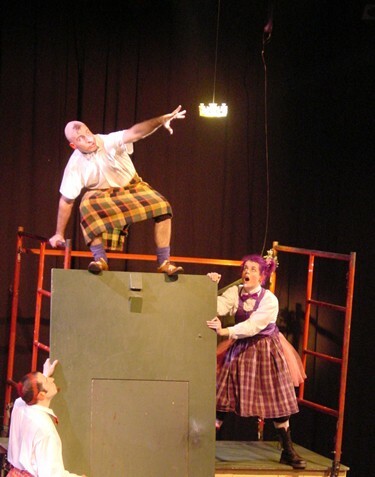 The techniques used by the 500 Clown troupe are circus arts, improvisation, and action-based performance coming from what is known as physical theater. Risks are taken. In 500 Clown Macbeth, a good deal of the performance involves climbing a wobbly scaffold to reach a crown that comes down from the ceiling. Paul Kalina demonstrated repeatedly his strength and fitness whether it is hanging from the top bars of the scaffold or doing a break dance on the floor in front of the stage. Adrian Danzig showed off in an Atlas like posture as he ripped up part of the stage and installed the flooring at the top level of the scaffold. In this particular performance, a child in the audience called out on a number of occasions exclaiming that the performers were going too far, that they were putting themselves in too much danger. Finally an adult behind where the boy was sitting with his mother complained, “Curb your child.” However, it was the bucket of blood that the three clowns began taking mouthfuls of and spitting at each other that caused several people in the audience to get up and leave. Or was it Kevin acting the role of Lady Macbeth, smiling insanely, and wiping menstrual blood from between her legs? What makes 500 Clown Macbeth, compelling are the small snippets taken from Shakespeare. When Bruce forces Shank off the top of the scaffolding, Kevin hands Shank a gun that he uses against Bruce. Then Shank is remorseful and says in a Punch-and-Judy-style, bare-finger performance that he doesn’t want to play any more. Kevin transitions into a comic-tragic Lady Macbeth mad scene (out damn spot) where the spotlight keeps going black until finally Kevin learns he must whisper the word spot. Occasionally there are some dead moments while the cast, ever alert to the audience, decides what the next moves might be. These pauses were not bad and actually gave relief to some of the edge-of-the-seat emotions stirred up. While there are some slapstick elements, this is out of the ordinary intelligent comic theater that keeps the audience in the present moment. No one could possibly snore through 500 Clown Macbeth.